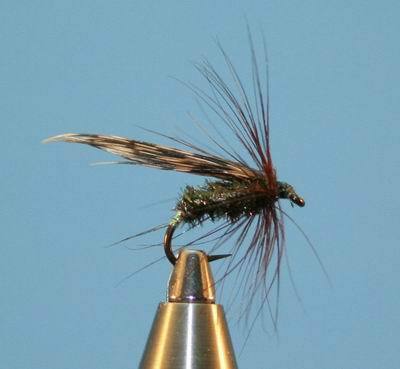 Alderflies -- Eaten by trout and other freshwater fish; fly fishermen try to imitate these insects by using artificial "flies". 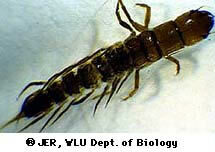 Alderfly larvae are a favorite amongst freshwater fish looking for a bite to eat. It is their underwater activity and relatively large size that make them a staple cuisine of many of the fish anglers love to eat. So fish eating alderflies help fishermen eat fish. Ironic, but true. The alderfly is a megalopteran insect of the Sialidae family. Megalopteran insects are so named because of there huge wings. They are not well known because they have very short adult lives, usually only surviving for a week, in order to mate. Afterwards they die. So what exactly is an alderfly, and why is it extremely important for every up and coming angler to know and recognize it? The “alder” is essentially the mature stage of the larvae which fish love to eat. The adult stage is an interesting looking fellow, with large wings, and a huge head. They usually are under water, developing for years before they final crawl out to molt and become fully developed. 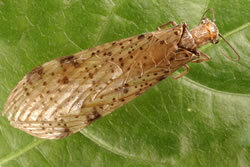 Most of the alderflies' life is spent under water in the larvae stage. The larvae is born after hatching out of one of numerous eggs that the female adult lay on grass stems that are growing near the shore. Once they hatch, the larvae make its way into the water where it spends a long time developing. The larvae have a relatively long body that is divided into the head, thorax, and a long abdomen which has seven pairs of filaments attached to each side. The larvae are equipped with powerful jaws that it relies on to hunt for small aquatic animals. It is during its extended lifetime underwater that it is a favored delicacy amongst fish. Alderfly larvae “flies” should mimic the seven pairs of filament on the abdomen as well as the six legs on the thorax. Almost anything that has multiple appendages will attract the attention of the fish you are interested in, so any fly that meets the general make up of a fish's favorite treat will be relatively effective. Good hunting and have fun.